The Center for the Study of Media and Performance (CSMP) is an interdisciplinary forum for critical inquiry into the many expressions of live art and screen culture. The Center invites faculty from across SDSU to join us for lectures, meetings, symposia, performances, screenings, and other presentations that explore the discourses linked by the keywords “media” and “performance.” The Center aims to engage leading thinkers in these and related fields in a national dialogue. To that end, we welcome the participation of SDSU faculty, students, and affiliates, as well as the greater San Diego community. The objective of the Center is to make a significant intervention into research practices in the arts. We take it as a given that art is a mode of critical inquiry. Proceeding from this premise, the Center seeks to bridge the divide separating theory and practice. Accordingly, some of the Center’s projects will take the form of practice-based research that uses media forms and / or live performance to interrogate youth culture, classic literature, and our contemporary world. Aligned with the mission of the College of Professional Studies and Fine Arts and the School of Theatre, Television, and Film, the Center will bring together artists and scholars to engage in the production of new ideas about critical analysis, as well as in devising, presenting, and other creative modes of research in the arts. To support exceptional professional activity that advances the discourses and methodologies of performance and media. Center leadership is committed to the wide dissemination of research findings. To support innovative approaches to research, especially practice-based research and other applied research methodologies. In addition to innovative scholarship, the Center supports art-making practices that engage scholarship in meaningful and noteworthy ways. The Center leadership will choose one or more themes that will organize the Center’s artistic and scholarly pursuits for several years at a time. 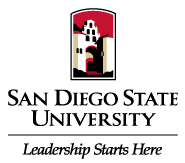 Our goal in selecting a focused research program is to establish a Cycle of Inquiry and Exploration that will contribute to a stimulating and productive intellectual environment at SDSU, and that will give the principal researchers time to build interdisciplinary, cross-campus collaborations around a particular topic. Initial Cycles include: 21st Century Shakespeares and Borders and Border Crossings. Public presentations in the form of lectures, performances, screenings, symposia, workshops, and a projected annual grad student Festival of New Ideas will serve to engage the public in both process- and product-based offerings. Public offerings will feature faculty, students, and regionally and nationally recognized guests. The work of graduate students in the Masters Degree Program in Theatre Arts, as well as the graduate programs of affiliated faculty, will be highlighted in this planned Festival. Looking to the future, the Center will provide a rich support network for students and faculty affiliated with several graduate degree programs, expanding curricular offerings with content representing the interdisciplinary discourses of studies in Media and Performance.